Commercial swimming pool heating has never made more sense than right now! Solaron provides Heliocol heating systems for household pools located at apartment complexes, condominiums, motels, hotels, fitness centers, and more. A Helicol heating system for any of the above applications saves utility costs, replacing natural gas or propane. Even better, companies do not have to pay the complete cost of installing a solar swimming pool heating system. Generous rebates are available to help pay the expenses involved in using solar heating with multi-family pools. Saving on gas expenses and the system installation is a win-win deal for companies in California! When you order a solar swimming pool heating installation from Solaron of Sacramento, we manage the complete project from start to completion. First, you receive a free consultation and estimate at your property in Winters. Second, we plan, engineer and obtain the permits for your installation. Finally, we build the swimming pool heater to your satisfaction and make certain that you acquire all applicable rebates. All you do is stand back and save money! 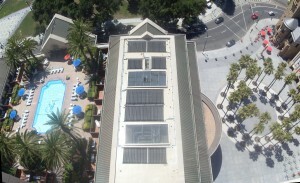 To start the process of installing your solar swimming pool heater, call Solaron today at 916-631-9293.